Sometimes I just want a mindless knit - and this hat managed to be that, with some little twists to keep it from being totally boring. First, there is a round of eyelets introduced into the ribbing section - you could thread a ribbon through these for extra oomph - and second, the decreases are done more gradually than usual in the hopes of creating a "conehead" effect. Otherwise, it's just knit knit knit all evening long! Join for knitting in the round, being careful not to twist, and place primary marker to indicate beginning of round. Round 1-4: (K2, p2) 16 times. Round 5: (K1, yo, k1, p2) 16 times. Round 6: (K2tog, k1, p2) 16 times. Round 7-10: (K2, p2) 16 times. 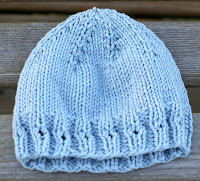 Work in stockinette stitch (knit all stitches, all rounds) until hat measures 3in (7.5cm) from cast on edge (approx. 13 stockinette rounds). Round1: (K8, place contrasting marker) seven times, k8. Rounds 2, 5, 8, 11, 14, 17: (Knit to 2 before marker, k2tog) eight times. Intermediary rounds: Knit all stitches. Note: there will be two rounds of all knit stitch between each decrease round. Round 19: K2tog eight times (8 stitches remain). Break yarn, leaving a long tail, and thread through remaining stitches. Drop stitches from needle(s) and pull tail tight to cinch hole closed. Sew ends to inside of hat.